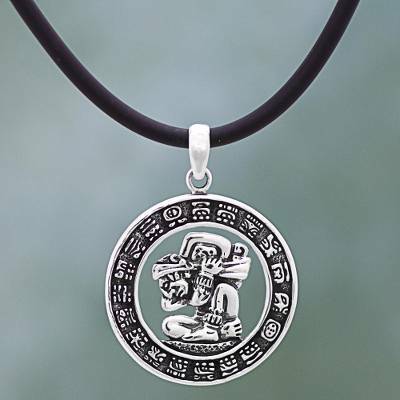 A circular medallion recreates the glyphs present in the Aztec calendar, representing a full year. In the center crouches a single man, known as Mam, or "carrier of time." According to Aztec legend, it is this person's role to carry the weight of a full 365 days upon his back, represented by the sack of stones that he bears. This character is depicted in excellent detail in this sterling silver necklace by Angel Ortiz. The pendant hangs from a sleek black cord. You can find sterling silver pendant necklace 'Time Carrier' by Angel Ortiz in jewelry categories such as Aztec Necklaces, Taxco Silver Necklaces, No Stone Necklaces, Silver Necklaces, Sterling Silver Necklaces, Rubber Necklaces and Pendant Necklaces. Enjoy exploring these sections for other Novica treasures.